Jack Wood for his runs in the PECO and Yorkshire Cross Country Championships and also his 5th place at the Stanbury Splash. There were no other nominations. Well done to Jack and Outi, this month's winners. From Dave Westhead ... For those Harriers (Jim and I) who did manage the drive across the Pennines a real treat was in store. Twelve kilometres of cross country on what would have been an excellent flat course had it not been for the snow. As it was, every step, and I mean EVERY step, left you well above ankle deep in soft slushy snow and mud. It was bit like running in a World War One trench. Our juniors certainly showed us seniors the way to do it today, with a great turnout of 16 or more runners, teams in U13 and U15 girls, and a WIN from Georgia Malir in the GU17 class. Results on NoEAA. From Steve Weston ... Great turnout of Harriers for the first IH League counter of the year. Ice on the Splash route meant that the route was changed to the 2009 ALS route. Bronte moor looked fantastic with a covering of snow. The snow made going tough in places but the usual bog patches were semi frozen giving the impression of running over very soggy tissue paper, certainly easier than the usual squelchy moor. Tom Adams was 2nd by a second! 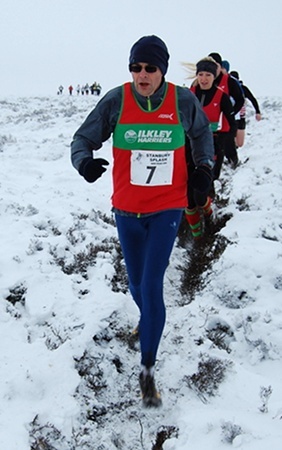 This was the first counter in the 2013 Ilkley Harriers Race League. A weekly 3 mile timed run at Danefield ... www.runsunday.com.. The Presentation Evening, aka The Do was a super evening with a great mix of people, plenty of time to catch up and chat, the presentation of the Annual Awards, the presentation of the 2012 Ilkley Harriers Race League winners, a raffle with really fab prizes (thanks Clare and Ben), and a great band Five Dollar Shoes. Read all about it in the newsletter, out soon! And see the previous holders in the roll of honour here. The dates for the 2013 League are available on the League page. From Henry Heavisides ... ideal conditions for running cross country this morning, a bright sunny but cold day with not too much mud. The course is a mixture of fields & woods with just a few short hills, covering 3 laps. I don't know how many people were running, but it was quite congested on the narrow paths on the first lap, then again when quicker runners were overtaking lapped runners on the 2nd & 3rd laps. Matt Cox did a fine run to finish in 11th place, with Jack Wood just behind. Our men's team placings were completed by Bradley Chapman, Henry Heavisides, Ben Joynson, Malcolm Pickering (running his first race for over a year after injury), Peter Haines & Neil Chapman. Results from www.pecoxc.co.uk, we are now leading in the men's team First Division. All senior training sessions are as normal this week, starting with Circuit Training on Monday 7th. Tickets for The Do will be available on Monday at CT, Tuesday before the run, and at other training sessions this week - bring �12 and get yours! Before Tuesday's committee meeting are there any more nominations for December Harriers of the Month and of course the Annual Awards, please? Well done to Andy Jackson who finished 2nd in this handicap race, with 67 runners. The weekly 3 mile timed run at Danefield has resumed... www.runsunday.com..
From Diane Haggar ... Lightwater Valley offered an amazingly mud free course, and unusually balmy weather conditions greeted us. It was a strange experience running alongside The Ultimate rollercoaster but the organisers did an excellent job with the course and parking, loos etc. On the ladies side we fielded 5 runners and were led in by Beth Massey in 50th, followed by myself and Kate Archer in 57th & 59th, Sally Malir completed the scoring team and Chloe Haines also ran. Ilkley were 13th ladies team out of 19. The outstanding female result of the day came from Georgia Malir who was 2nd U17 girl and gained Yorkshire team selection. I look forward to Georgia joining the ladies as a Junior lady next year. Superb. And a big thank-you to all the coaches and run leaders who lead these sessions, could you help in 2013? William Buckton reports ... I kicked off 2013 with this 8 mile toughie up Nine Standards Rigg from Kirkby Stephen. This was the 25th anniversary event and a record field of 166 took part. Carl Bell of Howgill won the race and broke the 1993 record. 97 ran, most in their jamies!